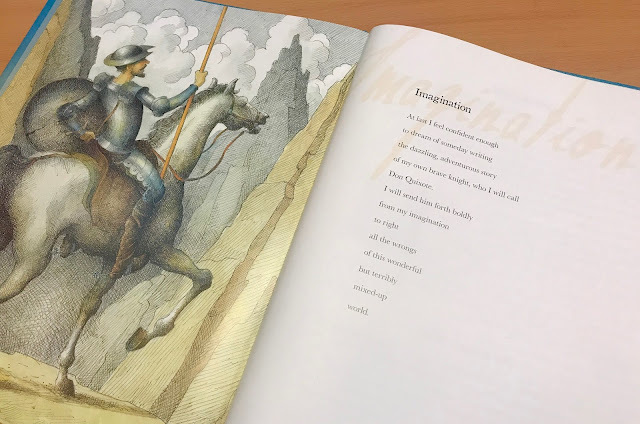 Why did I write a picture book verse biography about the author of Don Quixote, and why now, when so many modern problems seem overwhelming? I’m going to answer these questions as if I am interviewing myself, because the responses form a dialogue between my younger and older selves. Why is Don Quixote important to you? As a child, I grew up surrounded by images of Don Quixote. In Cuba, he is a beloved figure, with statuettes and re-told stories as common as comic book superheroes in the US. In Los Angeles, my father painted Don Quixote and Sancho Panza repeatedly. Sometimes the knight was attacking a windmill, but there were quiet moments too, riding off into the sunset, reflecting on the day’s rebellions against looming threats. Both the Cuban and American sides of my family accepted the importance of tales about an idealistic, misunderstood knight who longs to defend poor people against powerful monsters, and right all the wrongs of the world. Is the life of Cervantes relevant in the twenty-first century? As a child, I never thought about Cervantes. Don Quixote seemed like folklore, a story passed on by ordinary people. Quixote’s legendary heroism is so ingrained in the daily life of Spaniards, Latin Americans, and US Latinos, that we tend to think of him as a historical figure, rather than a fictional character. As an adult, the idealistic knight is still a hero to me, but I also admire his author: Cervantes was the real hero. He defiantly wrote a fantasy novel at a time when imaginative works were prohibited by the Inquisition. He wrote about book burning, and an ordinary man so determined to read freely that he absorbs the idealism of knightly characters. Don Quixote can be read on so many different levels that it’s easy to overlook the true story of Cervantes’ childhood. Born into the family of an impoverished minor nobleman, he knew the pain of a father in debtor’s prison, and a mother struggling to keep food on the table. These are experiences familiar to many children today. Homelessness, fleeing, plagues, wars, all of this resonates. Throughout it all, young Miguel found comfort in the power of his own imagination. Centuries have passed, but Cervantes is still a good role model for young readers who have their own daydreams. Perseverance—that is the real lesson of Don Quixote. This is what my adult self would want my child self to know and believe. No matter how crazy the world around us seems, we can remain hopeful by imagining, and then working toward, a better future. I can pinpoint the exact moment when I became fascinated by the life of Miguel de Cervantes. It was after 9/11, when the US invaded both Afghanistan and Iraq. I remembered reading that Cervantes had been kidnapped and sold into slavery in Algeria. After he was finally ransomed, he advised his family and the Spanish military not to seek revenge, and said that despite everything he’d suffered in North Africa, he still admired Muslim culture. I can’t think of a more relevant biography, now that the modern wars of revenge show no sign of ever ending. What was really unique about Don Quixote? Imagine the lives of ordinary people in Spain and Spanish colonies at that time! Books were precious, but not everyone could read, so one person would read out loud, while groups sat around and listened. People must have loved the accessibility of such a long, entertaining story that could go on and on, chapter after chapter, offering so many fascinating and satisfying adventures. Children must have listened to the same stories as adults. To them, perhaps the idealistic knight did not seem like a fantasy. Maybe they assumed he was real. Even though there weren’t enough books for every child to own—or even hold—one, at least they could get to know Don Quixote simply by letting their daydreams join his. Don Quixote was written in a time when the printing press was new, and for the first time, large numbers of copies could be distributed. Don Quixote reached the Caribbean and other parts of the Spanish-speaking Americas on ships that delivered goods from Spain. The oppressed of Spanish colonies could relate to an idealist who wanted to help the needy, but they also enjoyed the humor, the magic realism, the fantasy! Rules made by the Inquisition didn’t stand a chance, when pitted against the population’s desire for good storytelling. The book thrived, and still thrives today. Just as Shakespeare—a contemporary of Cervantes—is viewed as unique in English literature, Cervantes is now seen as the inspiration for all the wonderful literature of Spain and the Spanish-speaking Americas. Perseverance and the comforting power of the imagination are two themes in Miguel’s Brave Knight. How can young readers be inspired by those themes? Young Cervantes found refuge in daydreams, which are the starting point for every poem and every story that I write. Daydreams are like seeds that can grow into an immense forest, but only if the author keeps working to transform those dreams from a private experience into communication with readers. I think Miguel’s Brave Knight can be used to teach about creativity, and also to teach about the persistence of creative people. Just like dancers and athletes who rehearse and practice, writers need to keep trying. We can’t give up when our first drafts are still scribbled daydreams. We have to keep revising until readers can understand and share our dreams. Margarita Engle is the Cuban-American author of many verse books, including a Newbery Honor winner, The Surrender Tree; a PEN USA Award winner, The Lightning Dreamer; and a verse memoir, Enchanted Air, winner of many awards, including an inaugural Walter Dean Myers Award Honor and the Lee Bennett Hopkins Poetry Award. Her books have also received three Pura Belpré Awards and four Américas Awards, as well as a Jane Addams Award, International Reading Association Award, Claudia Lewis Poetry Award, and the Charlotte Zolotow Award. In 2017, the Poetry Foundation named her the Young People’s Poet Laureate. She grew up in Los Angeles, but developed a deep attachment to her mother’s homeland during summers with her extended family in Cuba. She was trained as a botanist and agronomist before becoming a full-time poet and novelist. You can visit her website here. Look for Miguel's Brave Knight at your local library, indie bookstore, or Barnes & Noble.